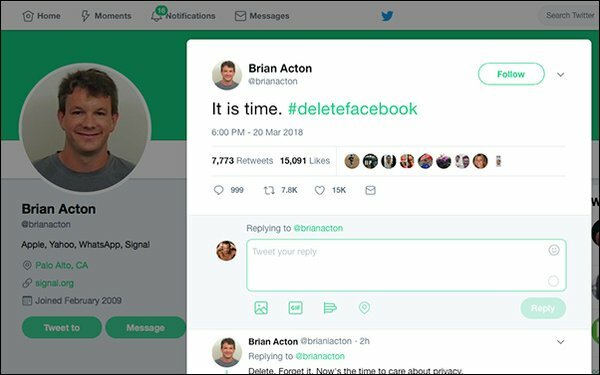 Convinced that Facebook has betrayed the trust of its users, WhatsApp cofounder Brian Acton is telling the world to delete the social app from their devices. While Acton has long advocated for user privacy, his call to action is still remarkable in light of the fact that he sold WhatsApp to Facebook for $19 billion in 2014. Acton walked away from WhatsApp earlier this year, while his fellow cofounder Jan Koum continues to run the mobile messaging service. Just last month, Acton invested $50 million in WhatsApp rival Signal. Analysts see a connection between Acton bashing Facebook and investing in Signal. “It’s not surprising given that Acton joined Signal after leaving Facebook,” said Jeff Pollard, an analyst at Forrester Research. Acton is not the first of Facebook’s ex-employees to publically decry the company. Of course, those statements were made before the world learned of Facebook’s failure to stop Cambridge Analytica from weaponizing user data in the run up to the 2016 U.S. presidential election and the Brexit Leave campaign in the UK. In response, the company’s stock price has tanked, while U.S. lawmakers are calling for further investigations into Facebook’s business practices. Even The Federal Trade Commission plans to investigate the matter, and, specifically, whether Facebook violated a 2012 consent decree. Still, some analysts doubt whether any amount of criticism can convince users to delete their Facebook accounts.